In partnership with Saga, Cortex has developed an application in Html5 to gamify the saving concept, rewarding the kids through a virtual world they could construct and modify as they pleased, one deposit at the time. Caring about its young clients has always been of the utmost importance to Desjardins, who has been helping school age users develop good saving habits for years. 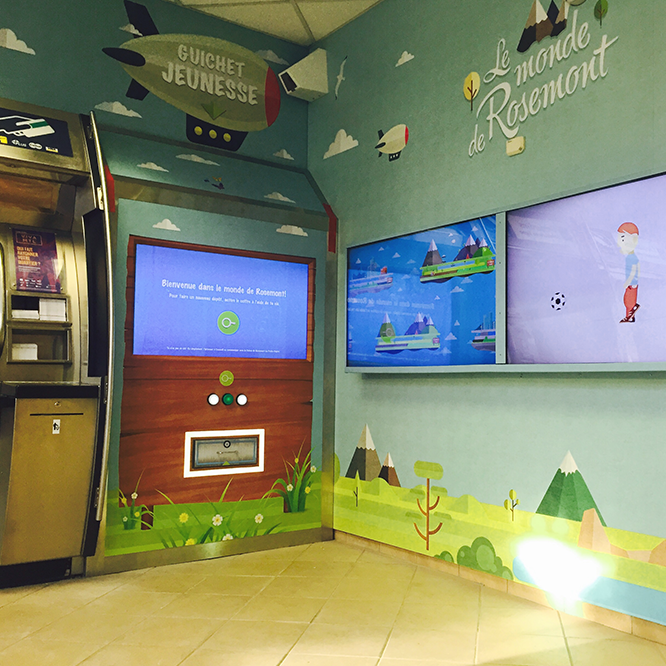 For the sake of innovation and to enrich its experience, the credit union has decided to challenge the limits by setting up a money deposit gamification project for kids by using Html5 development technologies. In partnership with Saga, Cortex's Html5 development team has developed an application to gamify the saving concept, rewarding the kids through a virtual world they could construct and modify as they pleased, one deposit at the time. "With Saga’s ioTHEATRE system, Cortex developed an application dividing information into three television screens, the first of which presented the deposit experience itself. The kid would proceed with his access card and be rewarded by a fun object he could place into his virtual world. The experience was concluded by a poll where the user could express how his neighbourhood could be improved. The second screen showcased the other kids’ virtual worlds all floating in the sky and the last television screen presented the poll results as well as advertisements. The whole project was entirely developed with web technologies, in HTML5, with WebGL. It was rolled-out on stick PC micro-computers. An online and AWS-hosted administration platform allowed the poll edition and the kids’ subscription to the program. "